Unless you are a fan of the original material on which a film is based, you will likely derive more pleasure from the experience of watching it if you know nothing about it beforehand. 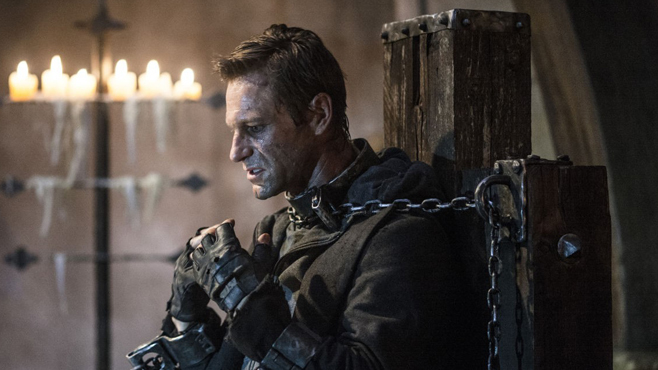 Which I found to be the case with I Frankenstein (2014) – of which I knew very little – the comic-book inspired action / fantasy by director Stuart Beattie, starring Aaron Eckhart, Bill Nighy, Miranda Otto and Yvonne Strahovski. The creation of the infamous Baron Frankenstein has survived his makers best efforts to destroy him. Leaving humanity behind the monster (Eckhart) has lived over two hundred years in the frozen wilds beyond the furtherest reaches of civilisation. However now a cataclysmic battle between the angels of Heaven led by their queen Leonore (Otto) and the demons of Hell led by their master Naberius (Nighy) is about to unleash Armageddon on Earth, and only the monster can stop it. I’m loathe to damn a film which, in and of itself, provides a reasonably harmless way to pass ninety minutes if you’ve nothing better to do. However – as with the glut of comic-book inspired outings which clog the local multiplexes with increasing regularity (and yes the spate of this year’s offerings will soon be on their way) – unless you’re a true fan who follows the intricate machinations of each of the characters in minute detail, you will likely be left coldly indifferent to their increasingly farfetched and fatuous adventures. Which is probably how you’ll feel with I Frankenstein, a film which on the poster promises plenty but in reality offers very little. If you like you’re tales of mad gentry and manmade monsters taking place in some mist shrouded European castle, then this is not the film for you. The main components may be present – Eckhart makes a suitably angst ridden and ruggedly scarred creature, whilst the scientific interest this time round comes in the form of the attractive Strahovski, and there’s enough laboratory apparatus and sparkling electricity to keep Boris Karloff happy. However, put the film under the microscope, and the one thing it’s missing is the very element the Baron in Mary Shelley’s gothic fantasy gave his creation – life! Clearly in an effort to appeal to today’s youth market the filmmakers have yet again remodelled a literary character into a CGI enhanced shadow of its former self. Take away the arching story of a battle between good and evil in the form of gargoyle angels and seen them before devil spawn, in which Frankenstein’s monster inadvertently finds himself a player, and there’s really nothing of any substance beneath. The end of course leaves it open for a sequel, the thought of which would likely have the Baron and his creation spinning in their graves. Let’s hope for their sakes, and ours, that the studio has the sense to leave this sleeping corpse well enough alone.